The New York Times reported on April 20th that several dozen retired military leaders with ties to groups competing for hundreds of billions in government contracts have for years taken part in a Pentagon campaign to generate favorable news coverage of the Bush administration’s handling of the Iraq war. Included were a number of retired generals and other high-ranking officers who are regular contributors on op-ed pages and TV. The story has implications of illegal government propaganda and, possibly, improper financial gains. The Times reporter, David Barstow, stopped short of making those charges -- but they are at least as logical as more benign interpretations. For the mainstream news organizations that took part, this effort is yet another cause of embarrassment. Some of the same outlets that failed to ask hard questions in the run-up to the war, it turns out, proceeded to carry water for the White House and Pentagon in the years since. I guess it’s not so surprising, therefore, that the story, still only a few days old, has just about disappeared. Salon blogger Glenn Greenwald has been writing about it in dismay; Amy Goodman brought it up on Democracy Now. Howard Kurtz discussed it in his Washington Post media column and on CNN. Other than that not only has there been next to no follow-up — no news stories — but there’s been hardly any mention of the story in the first place. Q. The media reform group, Free Press, has put out a video on the lack of press coverage and begun a petition drive “calling on Congress to investigate the military pundits and their ties to the Bush administration, defense contractors and our national news media.” A first, most logical reporter’s inquiry could go to Congressional leaders and leaders of any number of committees that could claim jurisdiction over unethical, illegal activities: Will they investigate? Q. What about the presidential candidates? Are they satisfied with a system that permits retired military leaders to work the Pentagon as lobbyists for corporations and serve as propagandists at the same time? Isn’t something wrong with both parts of that equation? What do McCain, Clinton and Obama have to say about it? Q. As David Barstow pointed out in an online Q&A on April 21, “It is not legal for the U.S. government to direct psychological operations or propaganda against the American people.” What view do First Amendment and constitutional attorneys have? At some point, propaganda becomes illegal. Did this program cross that point? Was it unethical, illegal or both? Or neither? Q. In 2001, Secretary of Defense Donald Rumsfeld created what was called the Office of Strategic Influence, an international propaganda operation. 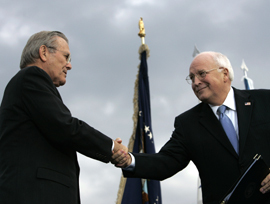 After complaints and ridicule when news of it broke, Rumsfeld said the office had closed down. Later he said the program had continued, with only the name abolished. Does that program still exist or not? Q. Why did the Times wait so long? (Two years to get FOIA responses?) Why didn’t it report the story earlier, even if only some of the facts were known? Getting big stories and holding them for very long periods of time has become a pattern at the Times and other news organizations. Their rationale, often, is that the reporting hasn’t been completed. Is reporting ever completed? Q. The Times story states that “most of the analysts [the retired generals] have ties to military contractors vested in the very war policies they are asked to assess on air.” Were there instances when it looks as though these retired military leaders or their business associates benefited financially from promoting the Pentagon-White House line? Anything that could be construed as a pay-off? Barstow spent a long time in his reporting and may have some answers to this question; if so, why not write them up? In short, this is a story that should have legs, and it will—if editors and reporters want it to. I wonder how imtimidated the Times was in non-completing this article prior to the election of Barrack Obama. Our entire reporting process was entirely distorted. Remember that "Scooter" was lunching with Judith Miller of the NYTimes to get positive coverage of GWB's illegal war. Plus, Joseph Wilson had his wife's undercover career exposed and therefore destroyed by the "thugs" in the BushCo. camp. Plus, we've witnessed the propangandistic nature of BushCo. Inc. This is a guy who was arrested for posession of cocaine while driving in Texas around the age of 18 and Poppy got that removed from his son's record because he was a Congressman; like he did with his 1st son's disasterous career as a pilot(?). Remember that he didn't go for his physical because the military was checking for drugs in 1972 and since he never gave up his coke habit; he would have gotten busted. It is amazing that his mental state was never questioned whenever he was having his annual physical exam while president. The mind is part of the body and should not have been exempted during those physicals. His actions have been demonstrative of the criminally insane serial killer that he is. No wonder he thinks that he can stand tall for not losing his principles. Everyone of his actions were for his own destorted "principles; i.e. screw the other side. His "principles" are basically completely political in nature as demonstrated by his "buddy", Karl Rove. The fact that he will be compensated for his disasterous record just wants to make me throw up. Judy Woodruff did a PBS News Hour segment on this issue on April 24th.